The Bentley Bentayga, a classy vehicle in its own right, is now extending the its luxury to your wrist in the form of an Apple Watch app available now for download. Using Bluetooth connectivity, the Bentley Bentayga app can synchronize with the British SUV's Touch Screen Remote system, giving riders dashboard-style controls at the tap of the Watch. Using the app, the car's climate controls, media player, seat adjustment, and massage functionality (it is a Bentley, after all) can all be adjusted on the fly for maximum comfort - or for fantasizing that you're James Bond. The app also tracks information such as distance traveled, speed, and outside temperature, which is certainly handy - provided you aren't already behind the wheel, in which case you'd think the odometer, speedometer, and thermometer on the dashboard would be handy enough. 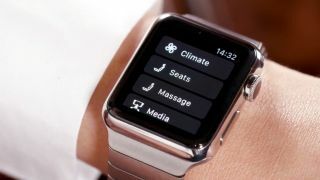 While in-car controls on the Apple Watch are more than likely a mild convenience at best, the mere concept of a "Bentley app" is luxury incarnate. Nothing says status quite like an app for your $300+ watch synced to your $550+ iPhone that adjusts the AC in your $230,000+ car. Remember that time Bentley made its own smartphones?